It Friday and finally the weekend has arrived. Don’t have any plans this Friday night? Why not pop along to K2 leisure centre in Crawley between 8pm-10pm where you can enjoy and take part in various activities including DJing. 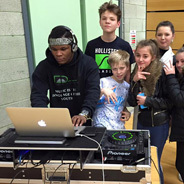 With the average turnout being in the region of 50-60 kids, we have been teaching young teenagers to DJ for over 5 years at K2 Leisure Centre. The atmosphere is buzzing, vibrant and enagaging. Bring your friends and show them your new DJ skills, better yet why not teach your friends. This is what we have been providing over the many years, teaching teenagers to pass on their skills to friends and become teachers themselves. With each week brining new faces, we ensure the newbies are encouraged to take part and offer them the chance to play a variety of Charts music ranging from Ed Sheeran to Taylor Swift, or even Britney? We welcome all ages 11-16, from all levels of experience to come along have a mix!